Beck's home for music must be in London. Himself and his band only few over to do later... earlier this week, but ended up staying and booking a couple of impromptu gigs in the capital. This intimate show at legendary Camden Electric Ballroom was something of an unofficial album launch party too; with a new record called 'Colors' set to be released the next morning at midnight was pretty spectacular for the lucky 1500 of Camden's music lovers had packed into the ballroom to share in that moment. 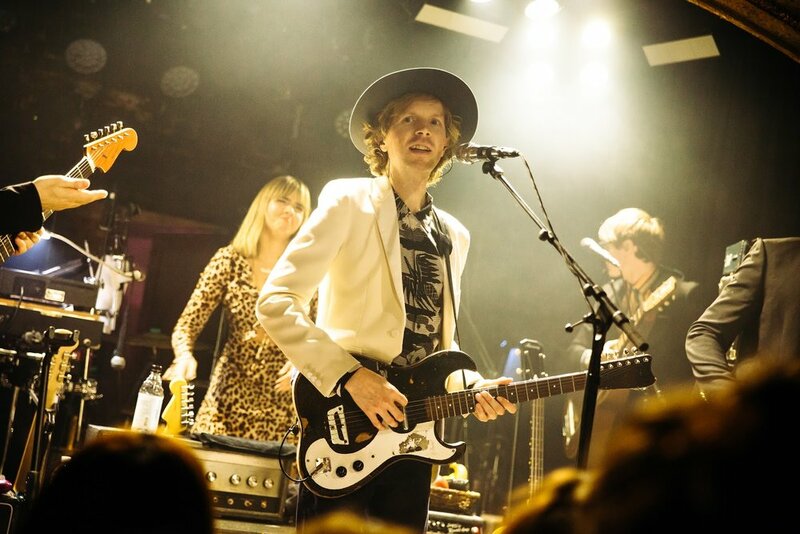 The legendary singer 'Beck' was suited and booted with his trademark black fedora, making a gentle start to the set with a succession of songs from his 2014 Grammy-winning record 'Morning Phase'. Note-prefect renditions of well-known tracks such as 'Goodbye and somnolent Blue Moon' just show how beautifully written some subtle tracks are performed live, but this doesn't keep things subdued for long throughout the set.... the evening is just getting started. The noise of wicked opening riff of 'Devil's Haircut' instantly made 1500 capacity venue shake with audience of their minds with their ballad-induced voices. Suddenly the ballroom was bouncing like mosh-pit would see at a festival. Beck and his band race through the gears at some speed. Beck and co.. are clearly in the mood for celebrating big time, amongst the precise performances of songs that across the Beck catalogue, the super-tight band launch into seemingly spontaneous performances of The Clash's London Calling 'Talking Heads', 'Once In a Lifetime' and a heartfelt rendition version of 'American Girl' in tribute to the late 'Tom Pretty' who recently passed away this month.